The need for replacing my P-bracket came about after picking up a length of polypropylene rope in Pollensa, Mallorca. I had previously fitted a rope cutter but its mounting was insufficiently strong to cope with the thickness of the rope, 16 mm diameter, and the three setscrews pulled out of the P-bracket hub. 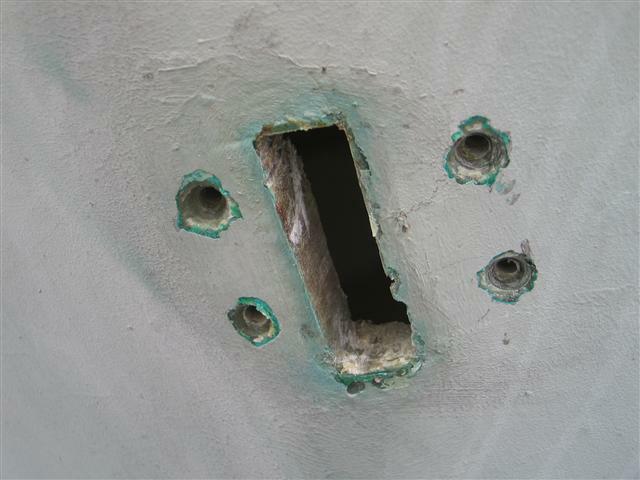 It may be that some corrosion had taken place weakening the bronze of the P-bracket. The condition of the bracket gave some cause for concern and I decided to replace it. I bought a replacement from Lake Engineering but found when it arrived that it was quite different from the one fitted, too long and without the change of section of the one in the boat. It seems that these brackets are produced to a universal design, although care should be exercised when buying, as the angle of the cutless bearing hub can vary. I decided to remove the old bracket and then modify the new one to match it as well as possible. 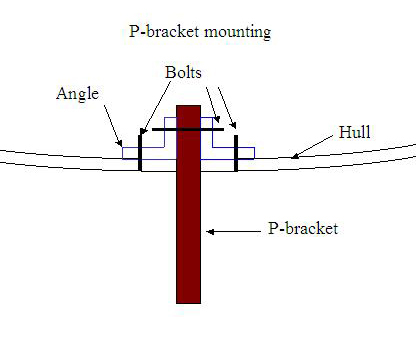 In most boats the P-bracket is glassed in to the hull of the boat, with flow coat over the top, making an understanding of the attachment method difficult. At this stage I had no real knowledge of what I would find underneath. I began by removing the flowcoat and all the fibreglass over the top of the P-bracket. When doing the job I used only a hammer and old wood chisel, to avoid creating masses of very unpleasant dust. 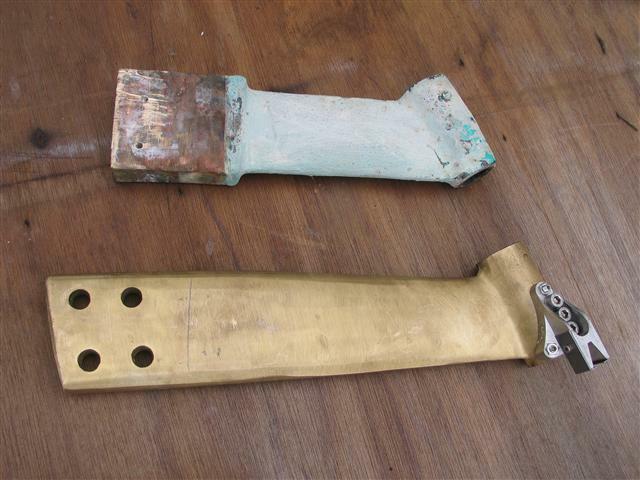 The top of the P-bracket was revealed once the surface layup was removed and, gradually, two lengths of angle that were bolted to it and to the hull, one on each side. Following removal of all the laminate it was possible to undo the nuts holding the angles to the hull. Knocking the bolts out through the hull showed them to be countersunk, 8 mm. I was now able to remove the bolts clamping the angles to the P-bracket. The P-bracket was now quite loose, although it required a knock or two to drive it from the hull. The appearance of the hull was then like this, with the countersunk holes that attached the angles. Having got the old bracket out I was able to compare it with the new one. I also realised that the original mounting was less than ideal, as the angles had clearly been added to the bracket in-situ, using long bolts that were only about 5 mm in diameter and attached via holes drilled at an angle. This may well have been easier to accomplish during the boat’s manufacture but was far from ideal from a structural point of view. The next step was to cut the new bracket to length. I offered up the bracket to the boat after fitting the prop shaft and supporting it in approximately the correct position before marking the cut line on the bracket with a pencil. I used an angle grinder to cut about 3 inches off the new P-bracket. I then reassembled it on the prop shaft and set it up rather more carefully in alignment with the stern tube before marking the position of the angles. The new holes through the two angles and bracket were drilled using a hand held drill, using cobalt bits. This is not the preferred method but was the only one available as the job was being done in a yard in France where I had no access to better facilities. I increased the bolt diameter from the previous 5 mm to 8 mm. The P-bracket was now offered up to the hull and the two angles were bolted up, getting them good and tight. I checked that the shaft alignment was good with the angles in position, measuring the gap between shaft and stern tube all around. At this stage if the brackets were not exactly right I would have made good with thickened epoxy, or epoxy and glass if necessary. It is very easy to achieve good alignment like this and I was able to cure a long-term problem. Once happy that the P-bracket positioning was good, I bolted the angles to the hull and checked again that alignment was good and that the P-bracketwas stiff, without any play. Good engineering practice dictates that the strength and rigidity of the bracket should be at its maximum at this stage, adding epoxy is a ‘bonus’ and should not be relied upon to fix any defects such as a small amount of play. Now the angles were unbolted from the hull again and rebedded using thickened epoxy. I bedded the angles onto the hull and re-tightened the bolts, again checking that everything was stiff, using plenty of epoxy paste to ensure it was extruded downwards to fill the space between the bracket and hull. It helped to wrap masking tape around the P-bracket against the hull, forming a dam to prevent the epoxy from running out. Once this had hardened, I filled any remaining gaps between the P-bracketand hull with epoxy paste. I then laid up glass and epoxy inside the boat, covering the angles and the bracket. Finally I finished with a layer of epoxy mixed with filler as a flowcoat. Finished job ready for antifouling. It took me about two days to do all this, working on my own in a yard without workshop facilities. After removal make sure all areas are clean and dry including the bolt holes. Give the area good sanding with a 40 grit paper, wipe clean with acetone. To get a good alignment and avoid resin running out, use micro-fibres mixed with epoxy resin, about peanut butter consistency, then put your bolts in and get the alignment perfect, clean up any material around the bracket exit because this stuff is hard work to sand after curing, but is very strong. Leave it overnight to cure and nip up the nuts after it has cured. Use only epoxy resin and cloth designed for use with epoxy, a 450 gram bi-directional or crows foot would be ok. Apply at least 4 layers each overlapping the last by 50 mm minimum all round, a layer of 250 gram rovings cloth will smooth out the finish and ensure any exposed fibres are covered. 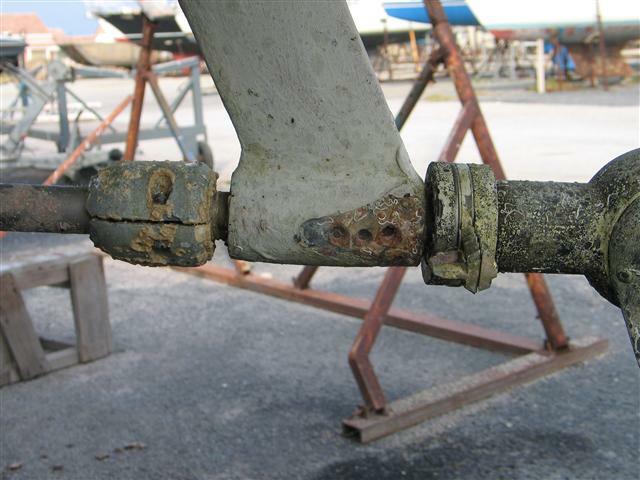 Epoxy will suffer from exposure to UV light, so give it a light sanding and coat with a bilge paint or other. Any filling or fairing below the waterline should be done with epoxy resin and ‘closed cell’ balloons, spheres or Q-cells. after curing add 4 to 5 coats of epoxy wet on tacky to avoid sanding between coats.